Soul Food for Hungry Adult Communities: Sunday Sept. 29th 2013: 26th Sunday in Ordinary Time. A friend of mine has a saying – ‘Greed grows on the heart like lard on a pig.’ And as greed gets worse, it affects our eyesight! We cannot see people, – we see only whatever food, money, luxuries that our hearts are lusting for. We become blind to the common good. Greedy systems, and the wizards hiding behind them, want to rob us of dignity, humanity, and solidarity. And so, in this parable today (Luke 16:19-31), we meet Rich Man Poor Man, coming face to face. Verse 14 (not included in today’s reading) tells us: ‘The Pharisees, who loved money, heard (his teachings) and jeered at him’. Jesus faces them down. Enter the Rich Man and the Poor Man. Lazarus, the poor man, ends up being ‘carried by the angels to the bosom of Abraham’. The rich man (sometimes called ‘Dives’, the Latin word for a rich man) ‘died and was buried’. Caput. There follows, through the parable, an intriguing dialogue between ‘Father Abraham’ (as the rich man called him) and ‘My son’. (as Abraham replies). Obviously the Rich man was a regular in attending Saturday Synagogue. But the words of Moses and the Prophets could never cut through the lard, the greed grown around his heart. There was a chasm between the wealthy society and that of the poor. Still is! 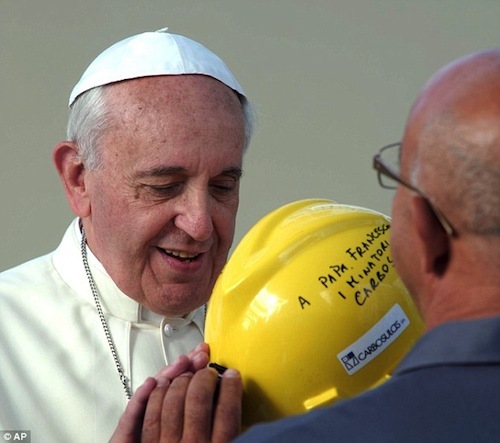 Pope Francis dons a yellow hat in Cagliari, Sardinia. The yellow helmet was emblazoned with the ‘Welcome to Sardinia, Holiness’. In this past week, Pope Francis visited Cagliari on this island off the coast of Italy. Here, youth unemployment stands at 50 per cent, and general unemployment is almost 20 per cent. Francis has made reaching out to the poor and most marginal the priority of his pontificate. Seeing the crowd of 20,000 or more, many chanting ‘Work! Work! Work!’ , Francis left aside his prepared remarks and spoke off the cuff . Using strong words, he denounced what he called big business’s idolatry of money over man.Unemployment “is the consequence of a world that has at its center an idol which is called money ,” while God has willed that “the centre of the world is not an idol, but a man and a woman” with their work. Read the parable again, where the dogs are licking the ulcers on the legs of Lazarus, while the rich man feasts sumptuously. Then, if you wish, read the following, from this past week,- an extract from Asia News about Pope Francis’ visit and his strong language: Click here. And what about where the society in which each of us lives? What has Abraham to say to us? Where are we, in this great divide? Who are we, in this parable? Which side of the chasm? We can change before we die. The lard is never too deep for change.